THIS IS A ONE-OFF SET... IT'S RARE THAT WE GET THIS SPECIAL STRIPED FABRIC IN STOCK... SO WHEN IT'S GONE, IT'S GONE! 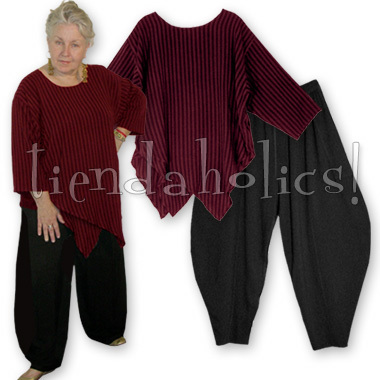 This Djura is in traditional djellaba stripes (otherwise a long wait special order item) of Pomegranate and Black, so I've matched it with our most popular pants, the harem style, in luscious black. These are the Marrakech harems—a style I've customized to be LONGER and more GENEROUS for our rubenesque bodies for those wanting more fabric than our customary Oda hareems! More details, including measurements, on the Marrakesh style, here. These pieces—including the Djura in this "special" fabric—sell separately for $168... but you can have it now without the wait and SAVE, too!